Figure 1. 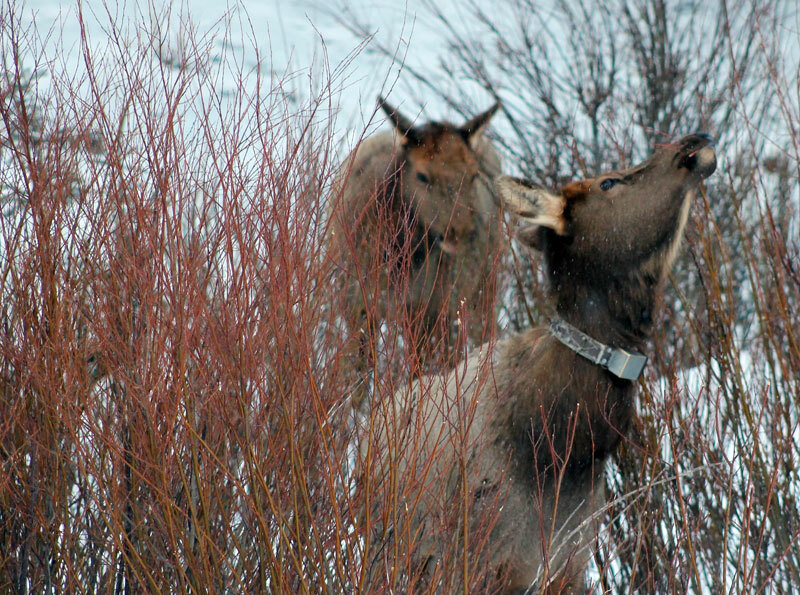 A cow elk fitted with a VHF collar using a willow patch on the Northern Range of Yellowstone National Park. Figure 2. 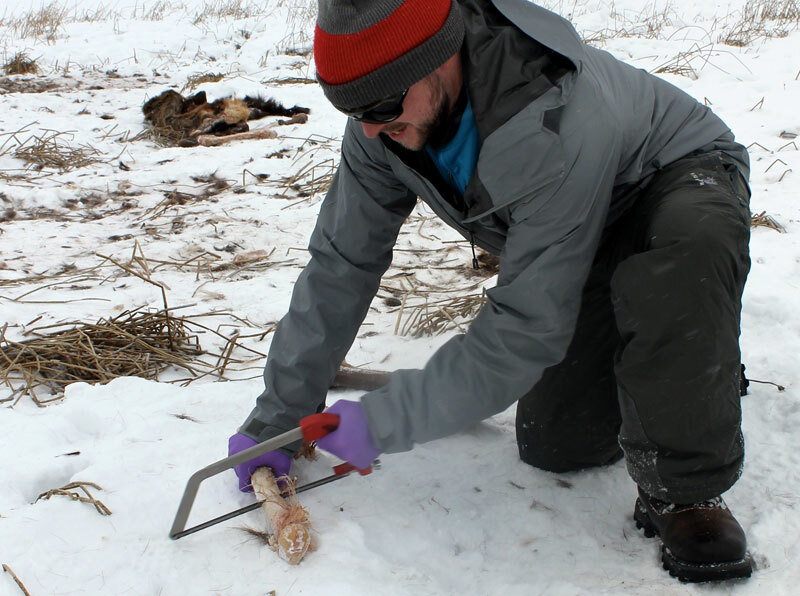 Ryan Kindermann examining the carcass site of a collared elk. Figure 3. 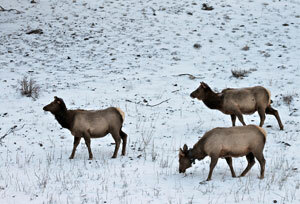 A group of cows searching out food during the long winters on the Northern Range of Yellowstone. The reintroduction of wolves to Yellowstone National Park (YNP) has been hypothesized to create a "landscape of fear" in which elk avoid high-risk sites, thus promoting recovery of browse species such as aspen, willow, and cottonwood. These indirect effects, termed a behaviorally mediated trophic cascade, have received widespread attention across scientific and public arenas. However, scientific studies have been varied and controversial regarding the extent to which a behaviorally-mediated trophic cascade (BMTC) is occurring in the Greater Yellowstone Ecosystem (GYE). This controversy is due in part to a lack of knowledge about the extent to which elk actually avoid areas of high wolf predation risk. Using GPS data from adult female elk from 2000-2004, we are evaluating the movement decisions of elk relative to numerous wolf predation risk metrics. In addition, we will compare the elk response to wolf predation risk to predation risk of mountain lions. Because it has largely been assumed that elk are responding solely to top-down predation factors, little work has quantified whether, and to what extent, elk may be influenced by a trade-off between top-down predation (e.g., wolves, cougars) and bottom-up factors (e.g., forage resources, willow distribution, snow depth). These decisions are likely a driving force in affecting community interactions (including a BMTC), and thus, are an important component that we will further examine in an effort to better explain the variability in findings within the GYE. In addition, we will also use high resolution spatial data of willow distribution on the Northern Range to quantify how elk use browse vegetation relative to both top-down and bottom up factors. Too conclude the study, the results from the early GPS data will then be compared to GPS data currently be collected (2012 – Present) in an effort to better understand if and how predator-prey relationships have changed during the past decade.